PUBG hasn’t been in the news as much in recent months thanks in part to the huge popularity of Fortnite. That doesn’t mean nothing is going on in PUBG land. 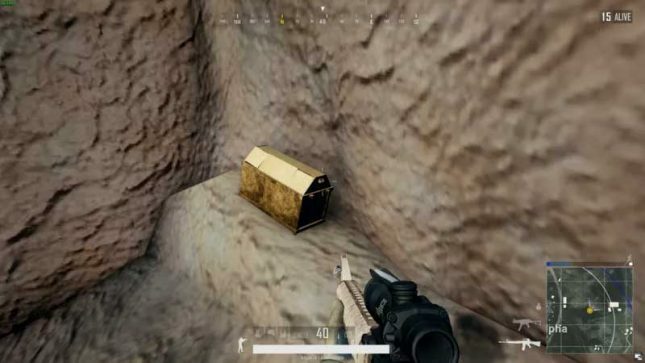 A new map has been in testing called Sanhok and players have recently been finding golden treasure chests hidden in the map. Sanhok is the map that was called Savage previously and is a smaller 4×4 grid island about half the size of other maps in the game. As the testing of Savage progressed more buildings and details were added and in the last round of testing the gold treasure chests turned up. The chests have turned up in inconspicuous locations around the map with one found behind rocks at Bootcamp Alpha and another in the forest northeast of the ruins. Sadly, there is no fancy treasure inside because the players are saying that you can’t interact with the chests reports Kotaku. There is no official word on what the purpose of the chests is, but perhaps they will be interactable when the map finally goes live. Until then some speculate that perhaps they are a simple shout out to Fortnite’s sparkling treasure chests.